A 5K Run/Walk and Family Fun Run to Benefit the Vascular Birthmarks Foundation on August 11, 2019. 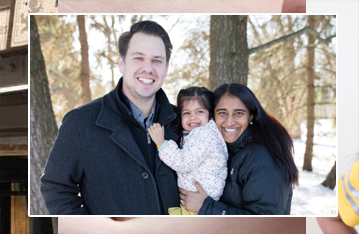 Our kind and strong daughter, Meghana, was born on March 4, 2015. She arrived absolutely perfect – dark brown eyes, a full head of hair and a special birthmark on her right cheek and chin! We found out months later that the special birthmark was called a port wine stain (PWS) – a kind of vascular birthmark. Our journey for answers and advice landed us at the Vascular Birthmarks Foundation (VBF). Not only did the VBF provide us with the knowledge base for making educated medical decisions for our daughter, but also with a sense of community and moral/emotional support, unlike any other. Meghana is currently receiving laser treatments for her PWS, which cause her to have temporary purple polka dots on her face. Our mission is to educate our community, raise awareness and encourage acceptance for everyone out there who are also sporting their very own “purple polka dots”! Register for the race or fun run. Get updated about the race by liking the PPD Facebook page. Learn about hosting a VBF Walk / Run. Start your own online PPD team or individual fundraiser page.